It's easy to stay active during warm weather, but cooler temperatures tempt me to hibernate indoors under the blankets. If you're like me, you might need some encouragement to stay active. Here are nine activities my family enjoys, and they might motivate your family to stay active, too, when the temperature drops. My girls love to play Just Dance on Wii, dance as they get ready for school, and dance to music as they clean their rooms. I've also been known to break out in a dance while prepping dinner or during commercial breaks as we watch TV. You can even host a dance party or do Zumba as you stay active and have fun this fall. Plummeting temperatures may prevent you from heading to your favorite outdoor camping spot, but you can pitch a tent in the basement or set up air mattresses in the master bedroom. Turn off your devices, cook on your indoor grill, and plan a scavenger hunt. Your entire family will still have fun while staying active and spending time together. Wherever you go this fall, look for opportunities to take the stairs as often as possible. I advocate this fitness activity all year, but I especially like it during the colder months. It keeps me healthy and warms my fingers and toes, which is an extra bonus I definitely appreciate! Whether you're an ice-skating newbie or expert, take time during cooler weather to try this aerobic sport. It's family-friendly and affordable. Plus, you'll have fun cheering for and supporting each other on the ice. Sitting still for too long isn't good for your circulation, heart, or health. As you watch a movie or a TV show, stay moving by jogging in place. If you can't jog, walk in place, jump on a mini-trampoline, or do push-up competitions with the whole family. You'll still see your favorite shows as you add activity into your family time. 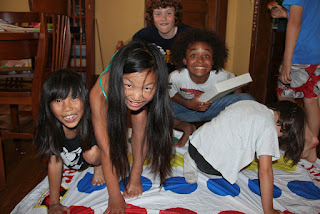 Active games like Twister keep my girls moving all winter. They have fun tying themselves in knots, and I appreciate that they're moving. Other active games your family could try include Simon says, hide and seek, and hide the button. If your kids love shopping as much as my girls, walk the mall this fall. Park as far away as possible from the entrance, speed-walk between stores, and opt for the stairs instead of the escalators as you get a workout and enjoy retail therapy. I love the fact that my family can access dozens of workouts at home. We can watch YouTube videos, play fitness games on the Xbox, and use our exercise ball, Hula-Hoops, or yoga poses to get a great workout. And while we're staying fit, we have fun together. At our local rec center, we can play basketball, swim, and take fitness classes. There's an activity for everyone in our family, and we love the opportunity to be active together. If you don't think you have time for another thing on your schedule, try meeting up for a basketball game after dinner or swim on Sunday afternoons. Staying active is more challenging when cooler fall weather hits, but you and your family can keep moving with these nine tips. What are you waiting for? Be a fit family and have fall fun as you stay active today and all season!